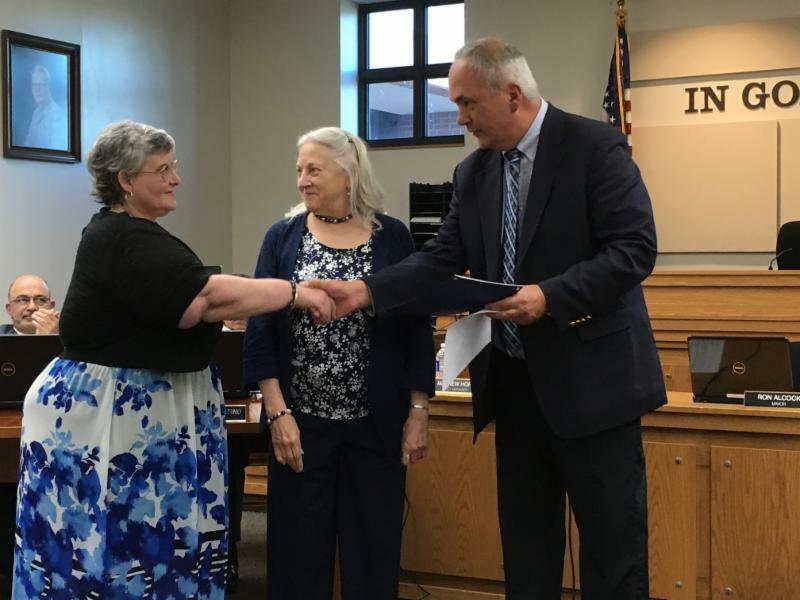 Geneva Mayor Ron Alcock presented three awards at the City Council meeting this week involving civic engagement. Earlier this year, the Mayor started his Mayor’s Institute of Civic Engagement. A neighborhood must have at least one active neighbor in each of these academies: Citizen Police, Citizen Planning, and Citizen Budget. There is no time constraint within which to complete the courses. We plan on presenting more awards next year as many people only have one more academy to complete. Sam Cappiello is the First Mayoral Fellow for the City of Geneva. Sam graduated from the Citizen Police Academy in Fall of 2015, and from the Citizen Planning and Budget academies this year. He also serves on the Ethics Board and the Aide to the Handicapped Committee for the City. Cappiello is a resident of Ward 5 and lives in Genesee Park and is active in the neighborhood association. “We are grateful for your dedication to learning more about how our city works, asking thought provoking questions, and monitoring the actions of City Council in all these ways that you volunteer. Congratulations on being the first ever Mayoral Fellow for the City of Geneva,” The Mayor remarked presenting Sam with this award. Harlene Gilbert from Historic North neighborhood represented the neighborhood as one of the neighborhoods receiving this award. Historic North has active members in its association and there has been at least one neighbor graduating from all three academies. Julia Wheeler and Carole Brown from Historic South neighborhood association represented the neighborhood at the meeting with the Mayor’s presentation. Both of these neighborhoods received certificates last night, but there will be markers created for the neighborhood gateway signs that will be installed noting this achievement for everyone to see in these two neighborhoods and also for future awardees.